This website is a collaborative effort by the Okarito Community Association to provide information on the people, environment, history and present day issues of Okarito. The small historic settlement of Okarito is built on a sand-spit within Okarito Lagoon. 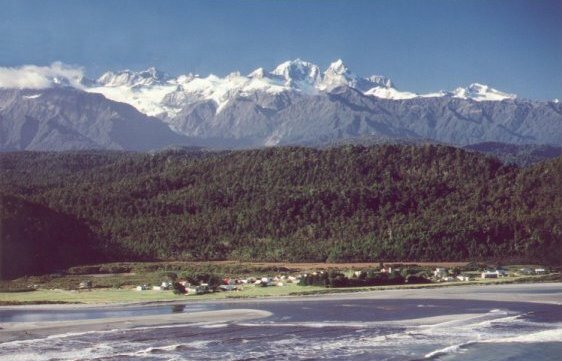 The village lies between the forces of the Tasman Sea and a natural landscape of wetlands and rainforests, dominated by the highest peaks of the Southern Alps, including Mts. Cook and Tasman. The name Okarito is synonymous with kotuku, the White Heron, a large white egret, which, in New Zealand, breeds only on the Waitangiroto River to the north and regularly feeds on the lagoon. Another national treasure is the Okarito Brown Kiwi. Around 350 birds are being intensively cared for by the Department of Conservation in the rainforests between Okarito and Franz Josef Glacier. Currently, about 30 people make Okarito their home. But the locality is special to many with holiday homes plus the tens of thousands of travellers from all over the globe who have visited and experienced the beauty and peace of this place. This website is for you all.